Hyperglycemia is an abnormally high blood glucose (blood sugar) level. Hyperglycemia is a hallmark sign of diabetes (bothtype 1 diabetes and type 2 diabetes) and prediabetes. Diabetes is the most common cause of hyperglycemia. Other conditions that can cause hyperglycemia arepancreatitis, Cushing's syndrome, unusual hormone-secreting tumors, pancreatic cancer, certain medications, and severe illnesses. The main symptoms of hyperglycemia are increasedthirst and a frequent need to urinate. Severely elevated glucose levels can result in a medical emergency like diabetic ketoacidosis (DKA) or hyperglycemic hyperosmolar nonketotic syndrome (HHNS, also referred to as hyperglycemic hyperosmolar state). Insulin is the treatment of choice for people with type 1 diabetes and for life-threatening increases in glucose levels. People with type 2 diabetes may be managed with a combination of different oral and injectable medications. Hyperglycemia due to medical conditions other than diabetes is generally treated by treating the underlying condition responsible for the elevated glucose. Continue ReadingHigh blood glucose, also known as hyperglycemia, can cause major health complications in people with diabetes. Several factors can contribute to hyperglycemia—including poor food and physical activity choices, illness or disease, or not getting the right dosage of glucose-lowering medication. If you experience symptoms of hyperglycemia, it’s important that you check your blood glucose levels. Untreated high blood sugar can lead to acute complications, such as diabetic ketoacidosis, and chronic complications, such as eye, kidney, or heart disease and/or nerve damage. What Are the Complications of Hyperglycemia? This is a buildup of ketones in your blood and urine. It can be poisonous and might lead to a life-threatening diabetic coma. If insulin is present but not working properly, blood glucose levels may get as high as 600 mg/dL. The body cannot use glucose or fat for energy, so the glucose is dumped into the urine, which causes more-frequent urination. If left untreated, hyperosmolar syndrome may lead to life-threatening dehydration and even coma. Good diabetes management and careful monitoring of your blood glucose are both very effective means for preventing hyperglycemia—or stopping it before it gets worse. Test and record your blood glucose levels on a regular basis each day. Share this information with your doctor at every appointment. Know how many carbohydrates you’re eating in a day, and strive to stay in the range approved by your doctor or nurse educator. 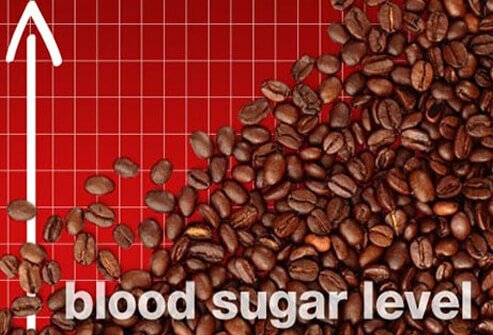 Keep this information with your blood sugar levels. Have a plan of action for if and when your blood glucose reaches certain levels. Take your medication as prescribed, being consistent about the amount and timing of your meals and snacks. An important part of managing your diabetes is checking your blood glucose level often—and then recording that number in a notebook or blood glucose log so you and your doctor can monitor your treatment plan. Knowing when your blood glucose levels are getting out of your target range can help you get blood sugar back under control before more significant problems arise. Exercise is one of the best and most effective ways to keep your blood glucose levels where they should be, and lower them if they get high. If you are on medications that increase insulin, be sure to talk to your healthcare team to decide the best times to exercise. If you have complications such as nerve or eye damage, talk to your healthcare team about exercises that are best for your situation. An important note: If your blood glucose is above 240 mg/dl, it’s vital that you check your urine for ketones. If you have ketones, do not exercise. Do not exercise if your blood glucose is above 300 mg/dL even without ketones. Call your doctor instead. Exercising when ketones are in your body may cause your blood glucose level to go even higher. Meet with a dietitian or nutritionist and work together to construct a healthy, interesting selection of meals that can help prevent higher blood glucose levels. Depending on your personal health history and your experiences with hyperglycemia, your doctor may wish to change the amount, type, or timing of your diabetes medication. Do not adjust your medicines without first talking to your doctor or nurse educator. In rare cases, emergency treatment is needed to lower your blood sugar. This type of treatment usually includes replacing fluids lost during excessive urination; electrolyte replacement, to replace minerals in your body lost as a result of inadequate insulin; and insulin therapy, to reverse the buildup of ketones in your blood. If you have a history of hyperglycemia, talk with your doctor about safe, practical ways to control your blood glucose. Cutting back on the amount of certain foods you eat might help, as can changing your medication or insulin.